Babysat the grandkids so Tess could go ride and gather cows… preg testing a small bunch tomorrow! 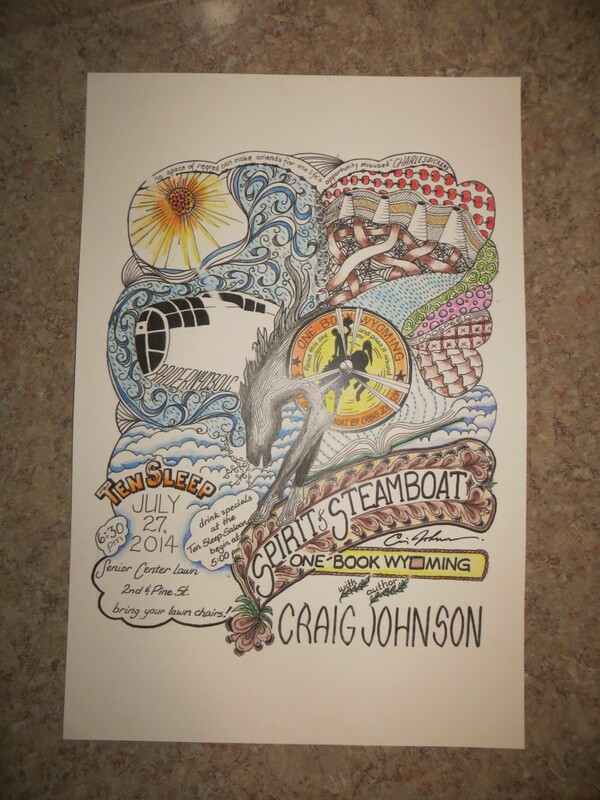 I did manage to put a bit of color on my poster’s test copy for Craig Johnson. It’s not finished yet, and I don’t like the pink/purple in the upper right corner… but that’s why it’s a test copy! More color to come, some shading on the outside edges… I like it! Yes, then I’ll finish a copy for him! I’ve said it before and I’ll probably say it again! YOU ARE SOMETHING ELSE!! BEAUTIFUL, CAROL! Ah, I can appreciate it that much more now that I read the book. You did a fabulous job pulling in all the elements of the story, and the color really adds to it! Wow! I didn’t know if I’d like it with color, but I Really do!